I don't consider myself the edgiest person, but I do like to put combinations together sometimes that push the envelope. When I bought this blouse, I thought about pairing it with a midi skirt to balance out the sheer, slightly revealing aspect of it. However, I pulled out my faux leather leggings at the last minute and thought that it looked edgy but still polished. I even considered putting a tank underneath it, but a basic black bra was enough since the lace panel was just down the middle of the shirt. While this look is perfect for a night out, I love the idea of wearing it for holiday parties if you don't want to go with a traditional dress or skirt/sweater combo. And even for a NYE look, this would be perfect! However if leather leggings is a bit too over the top for you, I would recommend it with a midi skirt (maybe a metallic one! ), some classic jeans or even some distressed ones and a fun faux fur jacket to dress it down a bit more. This top has so many options! 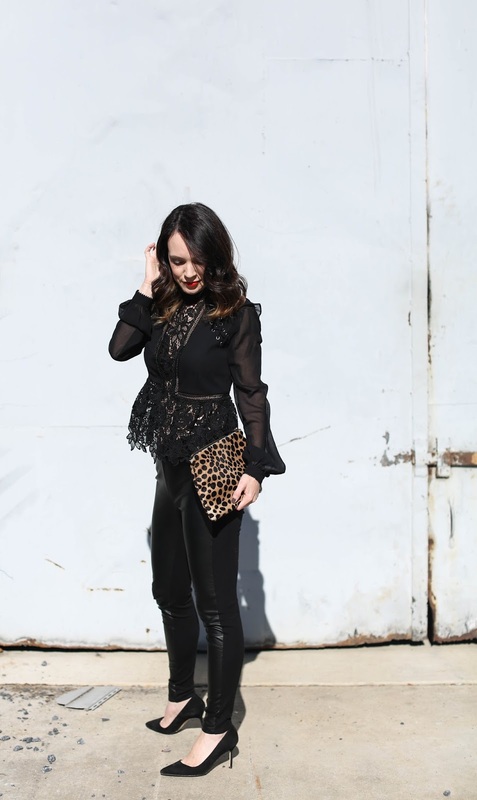 Lace tops are having a major moment now, because as I was looking for similar styles to this one - I found a TON of styles out now! In addition to the lace tops I added to the shopping widget below, there were a few more that I thought were worth mentioning. This one is under $70 and is selling fast, this one is so cute for layering and this is a nice change from a standard black lace top.